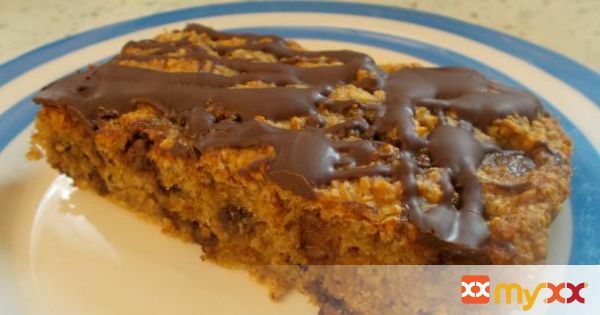 A scrummy cake bar that contains no eggs and no butter or oil. Just natural, healthy, ingredients. 1. Preheat oven to 180degC/350degF/Gas 4. Oil a 9 x 9 inch square baking tin (I used a silicone version) with a little olive or light vegetable oil. Add a strip of baking parchment as wide as the base of the tin, that extends higher than the sides, to aid removal of the cake when cooked. 2. Place oats into a food processor and whizz until the oats resemble a coarse flour. 3. Pour the oats into a medium bowl and add the baking powder, bicarb., salt and cinnamon. Mix them through well and set aside. 4. Break up the bananas into chunks and put them into the food processor. Add the vanilla, mango puree (or apple sauce) and honey. Whizz until all the chunks are gone and the mixture is smooth. 5. Pour the banana mixture into the oaty mixture, add the chocolate chips and stir until just combined. Don't be tempted to over-stir. 6. Pour the resulting mixture into your prepared tin and level the surface. 7. Bake for 15-20 minutes or until a skewer inserted into the center comes out clean. 8. Cool for 10-15 minutes in the tin, on a wire rack. Then, using the grease proof paper, gently remove the cake and set it onto the rack for drizzling. 9. Prepare the drizzle by placing the chocolate into a bowl over a pan of simmering water. Make sure the bottom of the bowl does not touch the water. Leave the chocolate to melt and don't be tempted to over stir, or the chocolate may seize and separate. 10. Once melted, remove from the pan of water and using a silicone spatula or the back of a large spoon, drizzle the chocolate over the top of bars. 11. Cut the bars into 8 pieces and enjoy!